The photogenic Greek island of Santorini, today best known as a paradise for holidaymakers, has its current form due to a powerful volcanic explosion that occurred here more than 3500 years ago. Like Santorini, other Aegean islands were also created by volcanic activity. 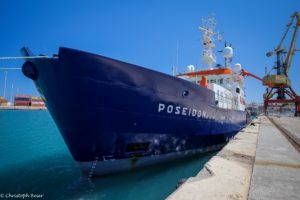 FAU researchers from the Chair of Endogenous Geodynamics decided to explore volcanism in the western Aegean up close and have just returned from an expedition on the research ship ‘Poseidon’. The Santorini super-volcano, which could have global effects – on climate for example – if it were to erupt again, has already been investigated in detail. The focus of the researchers from Erlangen, who work with colleagues from the University of Athens, is thus mainly on the more westerly volcanoes in the Aegean. These are generally smaller and appear to generate lava streams rather than being associated with dangerous explosive activity. It was only in 1987 that the submarine activity of the Pausanias volcanic field west of the Methana peninsula was discovered. This is located just 50 kilometres south as the crow flies from Athens. This subaquatic location was the destination of the team in late April. On board the research ship, which is named after Poseidon, the Greek god of the sea, were not only the researchers but also the PHOCA dive robot of the GEOMAR Helmholtz Centre for Ocean Research in Kiel. The aim of the team was to determine the age and composition of the volcanic rock and to gain insight into the types of eruptions produced by the submarine volcanoes. The volcanic field bears the name of the Greek geographer Pausanias, who reported that a volcanic eruption occurred on the Methana peninsula in the 2nd century CE. However, observations of the ocean floor did not reveal any evidence of such relatively recent volcanic activity. Most volcanic structures clearly appear to have formed more than 2000 years ago. The ‘Poseidon’ left Heraklion harbour on Crete on 25 April and sailed north for about 20 hours to the region of interest in the Saronic Gulf. The first research activity was to map the volcanic field, which revealed the existence of six smaller volcanic structures rising to a height of up to 200 metres above the ocean floor. It had previously been assumed that there was just one single, large crater here. Over the next few days, the team led by Prof. Dr. Karsten Haase was able to take numerous rock samples from all parts of the volcanic field over the course of several dives. The rock samples are currently being analysed in the laboratory of GeoZentrum Nordbayern at FAU in order to determine their age and composition. Once the corresponding information is available, the researchers will be able to postulate how the molten masses are formed underground, how they develop and how they reach the Earth’s surface. They also hope to obtain some general insight into the various eruption mechanisms of Aegean volcanoes.